There is always a time throughout the year where a quick, go-to appetizer recipe can come in handy. New years party, Super Bowl party, Valentines dinner, Easter dinner, Fourth of July party, Halloween party, Thanksgiving and Christmas. Not to mention all the other events and party’s you’ll be having between holidays. 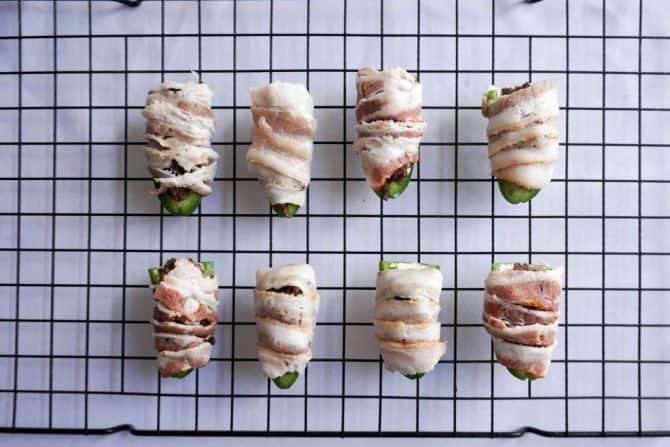 So, at the very least you can make this Bacon Jalapeno Poppers recipe 8 times a year! What makes this recipe so easy to make, but complex taste wise is the layers. Each bite is different, sometimes heavier on the cream cheese, sometimes heavier on the ground beef! It’s fun to put together and presents beautifully. Anyone who sees these will not only be impressed, but excited to dig in! Get Crazy With The Fillings! With this recipe you can keep it simple and go with the filings we’ve given you or you can change it up! You can fill the poppers with chicken and cheddar cheese, chorizo and queso fresco, or make it vegetarian with some mushrooms and onions. 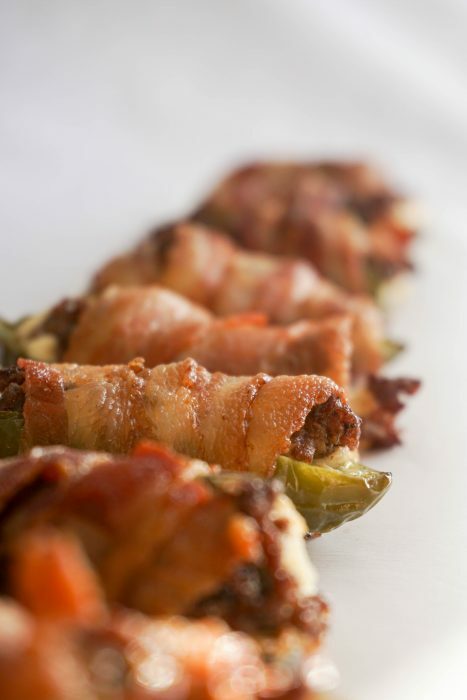 The possibilities are truly endless because bacon wrapped anything, even dirt, is delicious ? 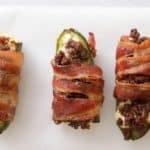 Although the changes you make in the filling will alter the nutrition below, the base of this appetizer – meat, cheese, and bacon is extremely keto friendly, therefore low carb and high fat! There will be no guilty feeling with each popper you pop even though you’ll get the delicious party appetizer taste you are expecting! Now, isn’t that the best feeling haha. So, if you’re planning your next big party, or small family gathering don’t forget to add these to the menu and watch them be devoured by keto and non-keto family and friends. TIP: These are pretty darn spicy so if you don’t love spicy foods go heavy on the cream cheese! Feel free to use other kinds of jalapeons too – the yellow and orange ones tend to be sweeter.